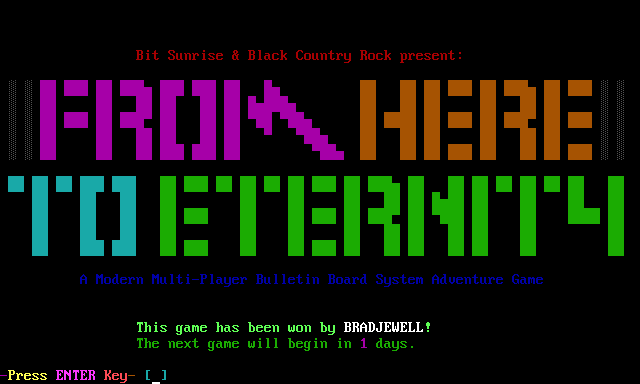 Shooter Jennings’ new BBS door game, “From Here to Eternity” officially launches today, Sept. 28, 2015. The game will last for 30 days, or until someone wins. You can access Bit Sunrise BBS and play the game over the web using a browser-based client at bitsunrise.com. If you want a more authentic experience, then fire up a terminal program like SyncTerm, and telnet to bitsunrise.com. And don’t forget to read my interview with Shooter. We talked about BBSing, retrocomputing, and how writing “From Here to Eternity” helped him after the loss of a close friend. This entry was posted in Uncategorized and tagged bit sunrise, door games, from here to eternity, shooter jennings on Sep. 28, 2015 .